A former elite soldier who stormed the Marmara has filed suit, arguing that pictures of the operation made him a life-long terror target. A former elite soldier who was among those to board the Mavi Marmara in May 2010 has sued the Defense Ministry for 800,000 shekels, Yisrael Hayom reports. The soldier says his face was shown in pictures of the operation, making him a lifelong target for terrorists. The soldier’s picture was shown by media outlets in Turkey and worldwide. The widespread publicity led him to cancel plans to study abroad, he said, due to fear that terrorist movements would identify him and target him in revenge for the incident. He is asking for financial compensation for the life-long impact he says the operation has had. The Mavi Marmara was part of a “flotilla” aimed at breaking Israel’s naval blockade on Hamas. Passengers on other ships stood down when their vessels were boarded by the elite Shayetet 13 unit. 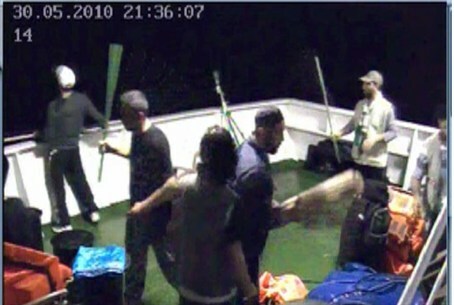 However, the passengers aboard the Marmara were armed terrorists from the Turkish IHH group who launched an attack on the soldiers, wounding several of them severely and attempting to take them hostage. The attack ended when soldiers returned fire, killing nine of those aboard. Turkish officials were outraged by the incident and have accused Israel of slaughtering Turkish civilians. The soldiers who boarded the Marmara wore balaclavas, but at least three soldiers’ faces were exposed while aboard the ship. Turkey has made attempts to prosecute IDF commanders involved in the incident.